“WASHINGTON — Fairfax County detectives are hoping to jog some memories in people who may help solve a March 2016 sexual assault and robbery in Springfield. Monday evening, police canvassed in the 7000 block of Commerce Street, going door to door and handing out flyers. On March 30, 2016, police responded for the report of a robbery. A 40-year-old woman was walking alone behind a shopping center, when a man pulled her into a dumpster, robbed her and sexually assaulted her. She went home, and called police. 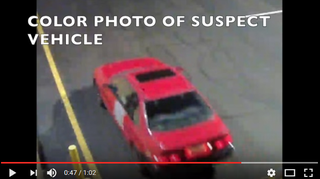 Fairfax County police released surveillance video of the suspect walking and driving an older model red car, with a large white or gray patch on the driver’s door. So, can the best car community on the internet ID this car?